The bar charts show education data related to young adults aged 15 years in 10 different countries in 2015. The first chart shows in which countries adolescents do the most homework in terms of hours per week. The second chart shows the nations that scored the best on an international science test. The first bar chart illustrates the number of hours spent by 15-year-old adolescents on homework in various countries in 2015. The second chart highlights the top countries with scores recorded in science by the same age group also in 2015 measured against an international standard. Overall, there appears to be a correlation between countries where children spent little time doing homework and higher science scores. Of the top three nations by hour spent doing homework, Finland spent the least time (2.8 hours) while South Korean and Japanese students averaged 2.9 and 4.3 hours respectively. Time spent by students in other countries averaged between 5 and 7 hours, while those in Italy spent the longest time (8.6 hours) doing homework, over four times longer than those in Finland. With respect to science scores, teenagers in Finland clearly scored the highest with a mean score of 568, despite spending the least time doing homework. Aside from Hong Kong (China) with 543, adolescents in the next six nations scored around 530 points. The lowest scores were recorded by Netherlands and the United States. Interestingly, Italy didn’t score within the top ten. Outline both charts and the year. Give the units used and all the important details. Data is from 2015, so remember to use past tense in your description. There appears to be a relationship between low homework per week and high science score. However this is only suggested by the data and not certain, so you should use appropriate language to simply mention that. Remember on IELTS we don’t want to analyse data, only describe it. Group information at the start to make it easier to relate to for the reader. You could also give a trend though you should be able to describe it concisely if you do. Vary your sentence style by beginning with subjects (teenagers) for some sentences, and using the object (time spent doing homework) for others. Make sure to show comparisons in your writings which is done above by contrasting Finish and Italian homework time. State the key highlight score first and compare with the first graph if possible. Group the next seven nations together. Mention the lowest scores, and the absence of Italy in the top ten scores. First bar chart illustrate the number of hour spent by 15-year-old adolescent homework in various countries in 2015. 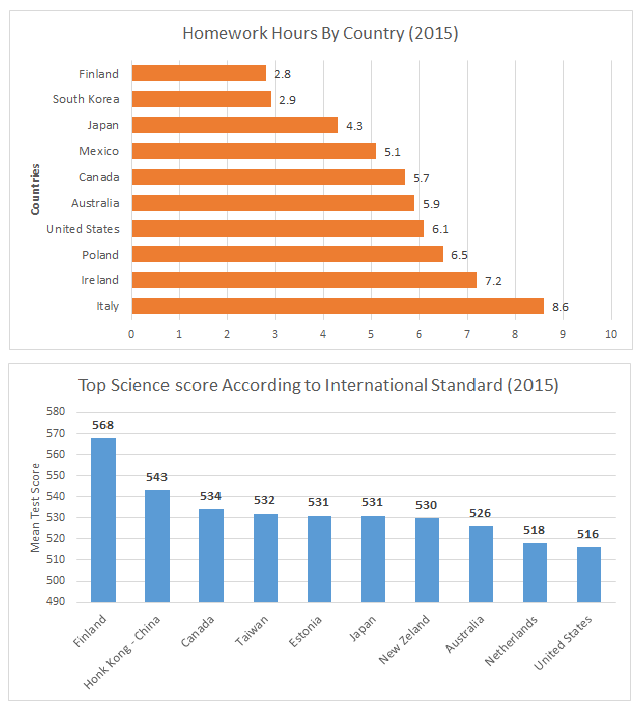 The second chart highlighted the top countries with scores recorded in science by same age group also in 2015 measured against international standard. Overall there appeared to be a correlation between countries where children spend little time doing homework and higher science score. Of the top three nation by hour spent doing homeworks, Finland spent least time (2.8 hours) while South Korean and Japanese student averaged 2.9 and 4.3 hours respectively. Time spent by students in other country averaged between 5 and 7 hours, while those in Italy spend the longest time (8.6 hours) doing homework, over four times long than those in Finland. With respect to science scores, teenager in Finland clearly score the highest with a mean score of 568, despite spends the least time doing homeworks. Aside from Hong Kong (China) with 543, adolescents in the next six nations scored around 530 points. The lowest scores were recorded Netherlands and United States. Interestingly, Italy didn’t score within top ten. Sentence fragment at the beginning of paragraph should have a comma after it, not a period. Look at the first chart. Which countries spent the most and the least time doing weekly homework? Can any of these nations be grouped together? Is there any relationship between these groupings and the rest of the data? Look at the second chart and look for any possible correlation, or relationship, between test scores in science and hours spent doing homework. Who scored the highest and the lowest? How can the data be grouped together to summarise it?